Depending on the situations, by applying one or more of measures, choosing correct equipments and accessories, we could definitely avoid blurred photos. It is not that, the core topic – How to Avoid Blurred Photos is discussed for the first time within this website, just like we demand more practice to be perfect, the next shot of guide for the same issue simply becomes more effective – because for the feedbacks we receive. 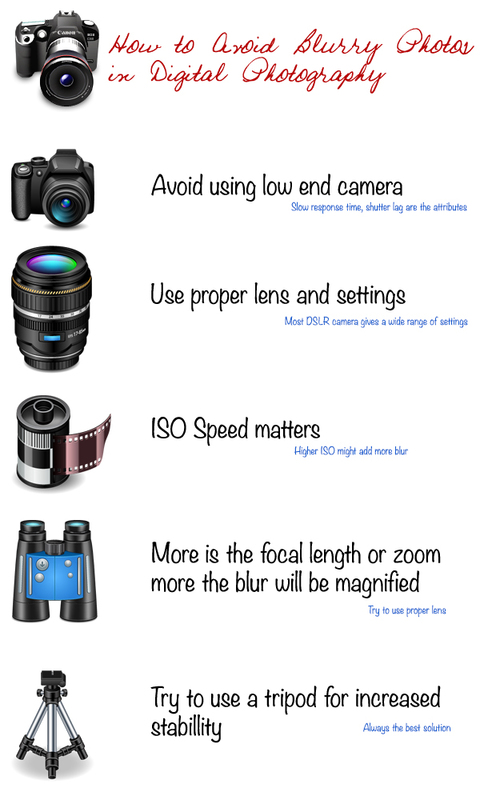 As said, this is not a new topic – but possibly the previous article, How to Avoid Blurred Photos in Digital Photography is merely an introduction. How often do you ever find yourself in situations where it was almost impossible to avoid blurred photos? It happened to you several times, for sure. It was always in situations where the available light was poor and the flash was not usable in someway or the other. Such situations may occur, for example in museums, concerts, theatrical performances, during celebrations in closed rooms, in the case of outdoor photos on evening and night hours and so on. Keep in mind the rule of thumb according to which the denominator of the fraction indicates that the exposure time must be greater than the focal length – for example, if we set the focus to 50 mm, the shutter speed should not be slower than 1/60 second or the values ? ?in the denominator must be greater than 60. Equipment with the appropriate characteristics and choosing the right accessories can come in handy to the photographer – this is the key for how to avoid blurred photos. All digital camera and lens manufacturers have some technique of image stabilization. Many compact digital cameras integrate technologies with different names with the common purpose of obtaining pictures does not work even in critical situations. Many lenses for digital SLR cameras integrated image stabilization systems (e.g. Nikon and Canon respectively labels with the initials VR and IS). Some manufacturers, eventually, additionally add a feature to DSLR that integrate stabilization in the camera body (for example, Olympus and Pentax). The differences between a lens with or without stabilization are felt especially when using focal lengths from 70 mm up. They are not a panacea, on many occasions we will need some accessories. When the exposure times get really long, it becomes physically impossible to avoid blurred photos until the camera is held in the hand. Usually, lower the shutter speed to which it is said that a photographer is able to take pictures not moved by hand, is 1/60th of a second. Some photographers are able to go down to 1/30 of a second, but it is more rare. Is Tripod is Really Useful ? How to Choose a Tripod ? For landscape, usually tripod adds the risk to non-maintenance of the horizontal line as monopod gives the degree of freedom in X and Y axis in 3D space. The tripods, especially those of better quality, can be rather cumbersome to carry around and even be unusable in certain situations. In some situations, even a monopod may not be convenient to carry. There is an accessory for these situations which is bean bag, its really bean bag literally. It is actually a bag of soft and mold-able material, small in size and so convenient to carry, on which you can rest the camera, getting proper horizontal orientation and stability even on uneven surfaces is far better even sometimes better than a monopod. This Article Has Been Shared 5379 Times! Cite this article as: Abhishek Ghosh, "How to Avoid Blurred Photos," in The Customize Windows, September 11, 2013, April 26, 2019, https://thecustomizewindows.com/2013/09/how-to-avoid-blurred-photos/.